The Laos government has approved a new highway development that connects the capital of Vientiane and Vang Vieng. 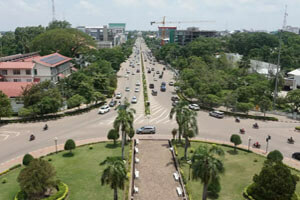 The project is a joint venture between Laos and China and it will build a new 4 lane highway. China Yunnan Construction is heading up the development and the Laos Investment ministry approved the agreement on April 6, 2018. The new highway is part of a much larger future project than connects Vientiane and Boten. The Laos government wants to create the new 450 kilometer highway, but obtaining funding is a challenge. The stretch between Vientiane and Vang Vieng is 114 kilometers and is expected to be completed sometime in 2021. The trip between Vientiane and Vang Vieng currently takes around 4 hours, but it can take much longer (sometimes over 6 hours) depending on traffic. The new limited-access highway will cut travel time to just 90 minutes. For residents and businesses along the new highway, living standards should greatly improve. With better access to the north country of Laos, tourism is expected to improve. Vang Vieng is one of Laos’ most popular tourist destinations. The project should also strengthen ties between China and Laos. Project managers are confident that they can complete the project on time. Chinese investment in the plan is around $1.5 billion. Part of the stretch includes a 680 meter tunnel through Phoupha Mountain. The tunnel will shorten the expressway and improve on travel time. The highway toll is expected to be between 45,000 and 57,000 kip ($5 - $7 USD). Once construction between Vientiane and Vang Vieng has begun, project managers will begin surveying the stretch between Vang Vieng and Luang Prabang province. Project managers do not have a firm timeline estimate for the final stretch of the tollway.